We decided to do the balloon/fairy idea. Thursday night, I went to Target and bought her a CareBear. I didn’t let her pick it out because she can’t make up her mind, but I think I did good. 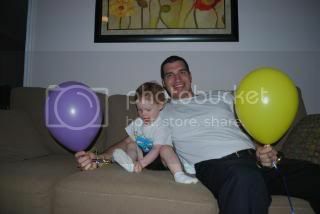 Friday, after work and picking #1 up from daycare, we went to the store to get balloons. 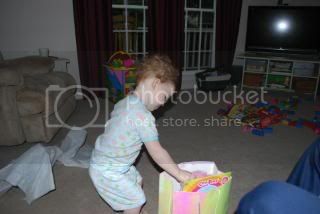 All the way there, she was saying “I going to store…I getting balloons.” She was so excited. I let her pick out the colors. She wanted yellow and purple, and I added pink. 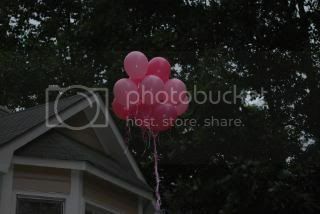 It worked to our advantage, because somebody ordered a dozen pink balloons and never picked them up. So I got 14 balloons for the price of 3. Back to the story. 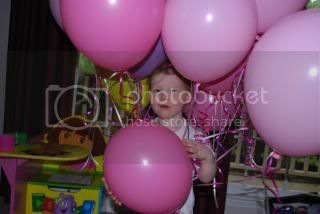 She was so good at the store, and wanted to help carry the balloons that would send her paci away. We got to the car, and thanks to Fay, the wind was blowing crazy. We looked like a circus act trying to put the balloons in the trunk. I put one in and two came out. I wish I had it on camera. A nice man came and helped me get them in the trunk…and we finally succeeded. 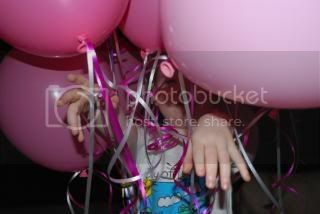 When we got home, I let her play with the balloons while we waited for daddy. She had a blast! 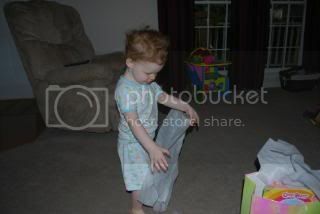 Of course, she got all tangled up in them. And, that yellow balloon….my nemesis! It would have been perfect, but you can still she the joy in her face. Zombie walk…she was really stuck. But, she took it for a second. Then, we said it was time to go outside and send them away, and she took it out of her mouth, and she was done with them. She really seemed to understand what was going on. Getting ready for the send away. Daddy explaining to #1 what was about to happen. She didn’t really want to hold them, but they eventually let go. One last look at the pacis, and it’s time to say good bye. And, they got stuck in the tree!!!! 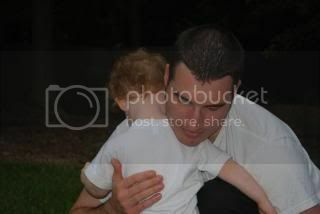 But, she couldn’t see them anymore, and once they were gone, she wanted a hug from daddy. She had such sad eyes, but no tears. 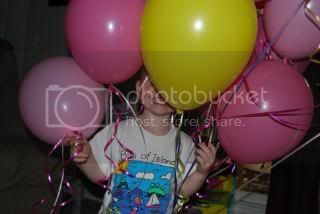 And then we went inside and played with two balloons that we kept. 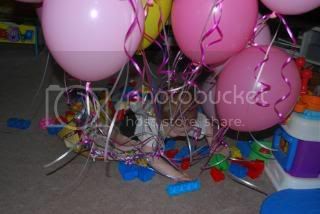 That night, she said a couple times “bye bye paci” and “paci all gone balloon.” She knew what happened. She’s a smarty and she got it. When we put her down, she fussed for a minute, then calmed down. Then, about 20 minutes later, she was up banging on the door and wanting mommy and daddy. Daddy went upstairs to put her back in bed, and as soon as she opened the door, she said “paci all gone.” And, she went to sleep! 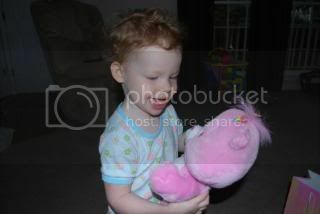 She was really excited about her CareBear. So, excited. 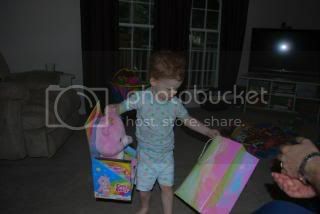 She gave her CareBear hugs and kisses and so did mommy and daddy. 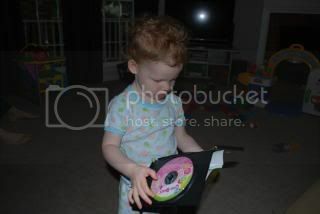 She also discovered the DVD that came with it. We still haven’t watched that one, yet. 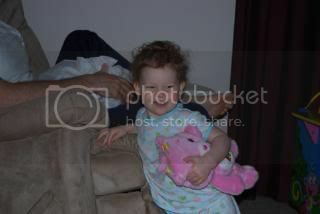 She gave her CareBear a ride on her car. She looks sooooo big and tall here. 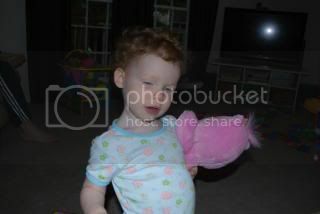 Oh, my goodness, she’s sooooo sassy! Her lay down at nap time and bed time sort of went the same Saturday and Sunday. But Sunday night we didn’t hear a peep out of her. She really REALLY did a great job and we are so proud of our big girl. Thank you all for your help and suggestions. We couldn’t have done it without you!! « We’ve been preparing all week. That is SO CUTE! I’m saving this idea for the possibility of having my own kids. I love that you did it!!! The pictures are so cute. I can’t believe it got stuck in the tree, lol. What a wonderful idea…It looks like such a fun time! Oh I’m so glad it worked out so well! Such a big girl..hope you have as good as luck with potty training! What a good girl. I had been thinking about you all weekend. I’ll have to steal that idea for when I work up the courage to cut Eli off. 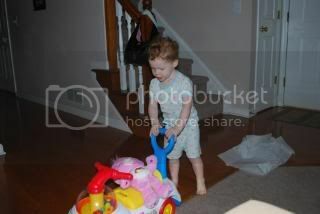 that is such a neat idea…much more fun and interesting than just tossing those paci’s in the garbage!! And yes, what a big girl she is. How come they have to grow up so fast?? Great job Krystyn. I say Izzy has one smart Mama!! oh honey i kinda got teary reading this!! how silly am i?? but truly adorable. another big step friend. and not just for her, but for you too!! 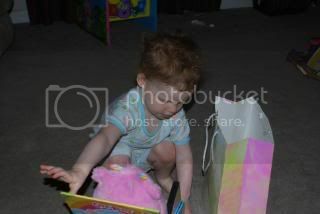 ps – we got one of those care bears awhile back and i was sooo excited that it came with the dvd. we watched it and i was sooo sad!! i couldn’t believe we used to be entertained by that?? curious what you guys will think! Hi! I am a native Houstonian now in Chicago. Your dd is a doll! Mine are in jr high now. My 11 dd is Khyrstyn and I have never seen anyone with a name even spelled similar to hers. She will be thrilled to know that she is not alone! She does like the unique spelling. Do you like the uniqueness or tire of the misspelling and mispronunciations? How sweet. 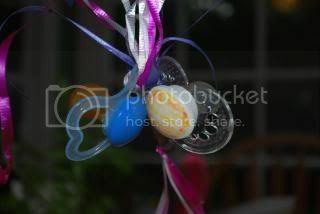 What a good idea for saying goodbye to paci. Great idea. Yeah! It worked!!!! wahooo…and good for you guys. a nice gentle way ! So glad the send off was not too dramatic. Sounds like a perfect solution. Your new blog look is fabulous! YAY for Izzy! She did such a good job. I’m so glad it worked out well. 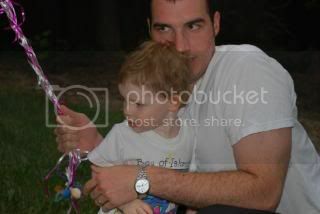 And I love all the pics. Thanks for letting us know how it went. Woohoo!! Such a cute idea! I’m going to remember that one. The blogging world came to your rescue, and it sounds like she handled it well. The fairy will be very happy. Or at least the tree will! A big step for a little girl. Someday you’ll look back and wonder where that time went. 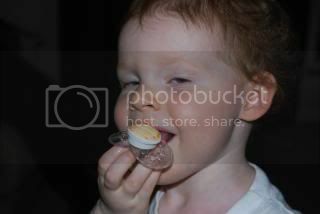 I’m glad the paci fairy cam through for you- *wink*. I hop she does ok without it. I’m sure she’s all but forgotten it. Now don’t get the new baby hooked on one…. Awesome! Thanks for Taking us on this sweet Journey with YOU guys. I actually HAD to wipe that Tear out of MY eye!!!! This was so sweet! Sounds like you did an excellent job! The paci thing was a great idea! Hope everything continues to go well! What a great idea!! I’ll totally have to do that. PS I met you on momdot today and you WON!! What a great idea! I had to laugh when the balloons got stuck in the tree though. You have such a cute little one! Congrats on your win over at MomDot! What an awesome idea! 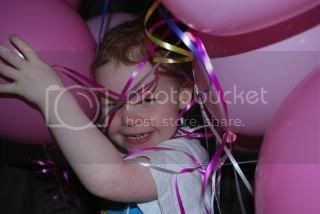 I am totally stealing that one from you seeing my Fifi LOVES balloons. 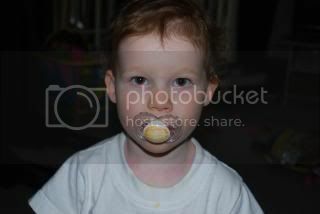 COngrats with the paci!!! What a great idea and she did such an awesome job! GREAT job Krystyn. You’re already a pro. We said bye-bye to “ba-ba’s” on their 2nd birthday. I was way more worried about it than I needed to be. Just like your little I, after all the work, they really DO get it, and it really IS okay. Kudos. Love all the photos. What a cute idea! 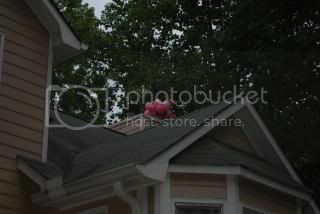 And I love that the balloons got stuck in the tree. Classic! Oh that is precious! I’m so glad it worked out for you guys! Ahhhh, my oldest lost hers and that was that. It was great. 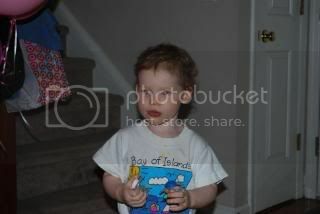 Then her sister came along a few months later and I found her sucking on her sister’s pacifier. I only found it once. I think she just wanted to give it a try. And you know our third is 5 years younger than our middle child and she too had to “taste” her brother’s pacifier shortly after he was born. Gosh it’s been four years or so since she had a pacifier and she was sucking on her brothers. I think they just want to see what all the excitement is about. 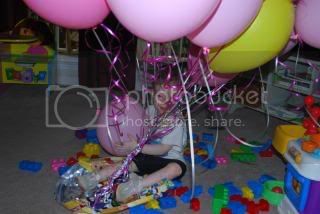 I wonder if that would work to help wean my Spanky from nursing–he loves balloons.